Scarlett Mysteries: Cursed Child Collector's Edition is rated 3.5 out of 5 by 43. Rated 5 out of 5 by lillyrush from Good game This is a good game, I love games that have victorian eras, The only thing about this I don't like is Scarlett's voice. Rated 5 out of 5 by Tomsde from A Very Nice Game If you like the Steampunk genre of games this should be right up your alley. The artwork and music were beautifully done. The story line was enjoyable and it wasn't gory or disturbing. A good creepy game for younger people as well as adults. I didn't find anything not to like about this title, the hidden object scenes were well done and artistically done without being redundant. Rated 5 out of 5 by greenshade from LOVED IT ! 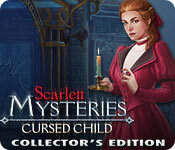 Adding my 5 stars and hope there's more Scarlett Mystery games! Rated 5 out of 5 by nmkelly from Loved this Game I loved everything about this game - the plot, the music, and the puzzles were fun but not overwhelmingly hard (which sometimes irritates me). Great job! Looking forward to a sequel! Rated 5 out of 5 by Eveoflove from An interesting game I'm surprised that the key contributors have not posted a review of this game yet and that I'm the first one... with my first review (despite reading others' for years!) Let me begin by saying I've played and enjoyed the demo, and will be buying this game, the first of a potentially new series. The story is interesting, and I like the voices in the narration of the storyline. I play these games to be entertained for a few hours, as an escape from everyday "reality". I find that many reviewers are severe in their judgement because they compare with other games... Me, I spend about the price of a burger combo from a typical fast food place on a game like this on Big Fish (they have many special sales) and these games last much longer than those meals. It's a small investment and you can re-play it if you so choose. The graphics are well done and somehow different than many other HO games; I liked the sense of "tension" throughout the scenes I've played. The puzzles are fun and some HO scenes are creative. Is this game particularly original with a new, never-seen-before story? Nope... but it seems entertaining enough so I can feel I'm getting a good ratio of bang for my buck. This was developed by the folks that brought us innovative games like "9 Clues", "Enigmatis" and "Grim Legends". Try it for yourself... forget logic and being overly critical, and see if you feel, like me, that you're getting your money's worth! I've got hundreds of games in this genre, and I don't focus on similarities/differences. Like at an amusement park, I just go along for the ride! Rated 5 out of 5 by Mystic35 from WOW!!! What a great game! Love, love, loved this game! The storyline was great hopefully they make more of this game into a series. Rated 5 out of 5 by luv_my_bagel from What a Great New Game Based on the completed demo, this is a game that I'm ready to buy. 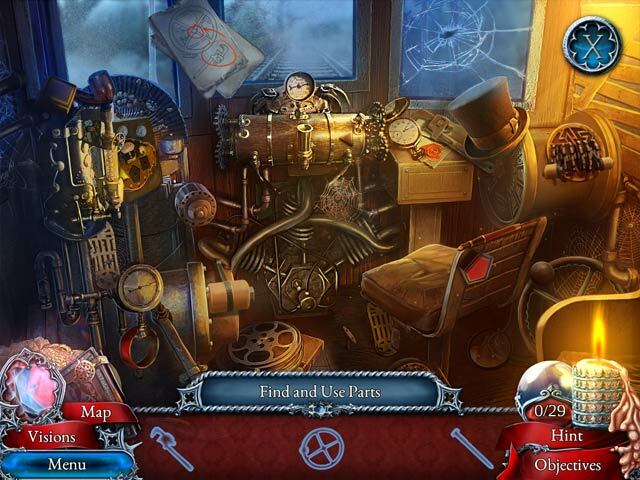 Fun new HOP's and morphing objects that are actually difficult to find make this a great entry into the Hidden Objects genre. So far the games are fairly easy, but the HOP's make up for that lack in their originality. I especially enjoyed the HOP where you have to find objects that are circled on 3 child's drawings. Overall, I enjoyed it quite a lot. However, be sure to try the demo for yourself before deciding whether it's a purchase for you. 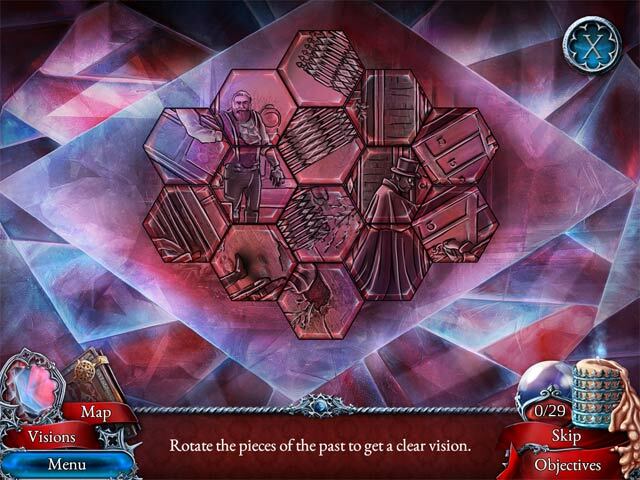 Rated 5 out of 5 by nariiska from With clarity from your visions and puzzle solving skills to reveal all This game does not disappoint you are on a unique adventure to find answers about your past. Clever puzzles have you looking high and low for answers and hop's are fun to play. Rated 5 out of 5 by biscuitsmama from WHERE IS YOUR FATHER AND WHAT IS STEAMEYER HIDING IN HIS MANSION? It’s been a very long time since that day when your father dropped you off at an orphanage telling you that one day you would be together again, when the time was right. You’ve almost forgotten your powerful psychic abilities that made your childhood a nightmare and now with the receipt of a letter addressed to your father that was accidentally delivered to you, all of those memories have returned. After contacting your local post office you have been directed to a station in the suburbs where the letter was originally posted. You finally track your father to the residence of Baronet Steameyer but when you arrive, the Baronet tells you to leave because you are not safe there. Why would he say such a thing? As you prepare to leave you see a woman in a window apparently signaling to you so you can’t leave now you must find a way in and at least speak with the woman. When you meet up with Steameyer again, it is apparent that he will go to great lengths to stop you – but why, what is he so afraid of or what is he hiding. 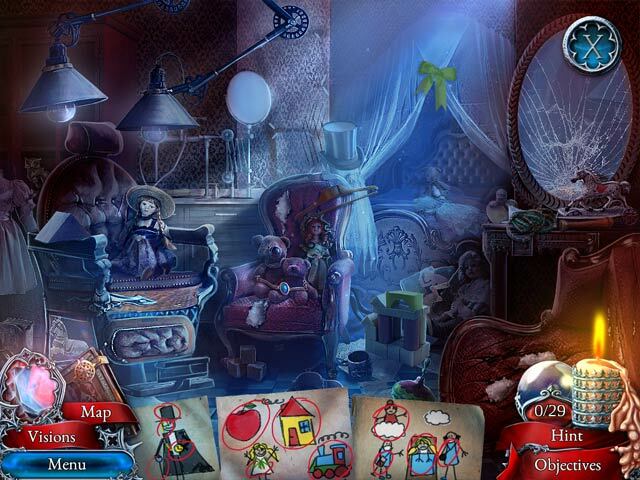 You will need to play the terrific HOPA game to figure out the answers to those questions and find out what is hidden in the Steameyer mansion. Scarlett Mysteries the Cursed Child is an easy game as far as the HOPS and Puzzles but it wasn’t always apparent what I needed to do to move forward. I had to use the dreaded hint button more than once to figure out what I needed to do or find. Your tools include the interactive map and a signet ring that will help you focus your psychic abilities. Each time you use the ring, you must solve a puzzle to help bring things into focus and when the puzzle is completed you will receive another clue. I love the steampunk settings and all of the things you discover as you explore and play this game. The HOPS are really nothing special but they do include variety and some that are progressive and interactive. The puzzles are very easy but still fun. Some of the puzzles include my favorite a slider type puzzle and then another where I need to sort items on a grid by color into rows and columns. I do hope for some more difficult puzzles toward the end of the game but I am still enjoying the mystery and the puzzles I’ve needed to solve thus far. The CE has morphing objects that appear to be the only collectible. If there are others I haven’t found them yet and since most of the extras are locked until the game is completed it is difficult to determine. Aside from the morphing objects the other extras are the standard fare with nothing special included. There is a 61-page Strategy and at least for me the game seems long. Steampunk games are ones that I generally love, and although this one is what I consider slightly steampunk it is a lot of fun. As the mystery develops I find myself more involved in the storyline. Is Steameyer insane, a murderer, or is he simply a father who will go to great lengths to protect his child? If solving the mystery draws you in as it did me then you too will hit that buy button. Even though this is a wonderful game for me, please try the demo to see if it is one you will enjoy as well. Happy Gaming! Rated 5 out of 5 by dlcoyte from Demo was a bit short but graphics are beautiful and music is pretty good too. I will be buying this and hope it ends up a bit longer than what the demo gave me.